System Requirements: Windows® XP and Later, Mac OS® X 10.4 and later, with USB port. Side to side movement of scroll wheel. Summary: The Logitech Performance MX has a nice, comfortable feel. It is very responsive and the battery lasts all day for me, which is roughly 12 hours of continuous use - I plug it in to charge every night. For me it has worked on wood, glass, fabric, and laminated desktops. 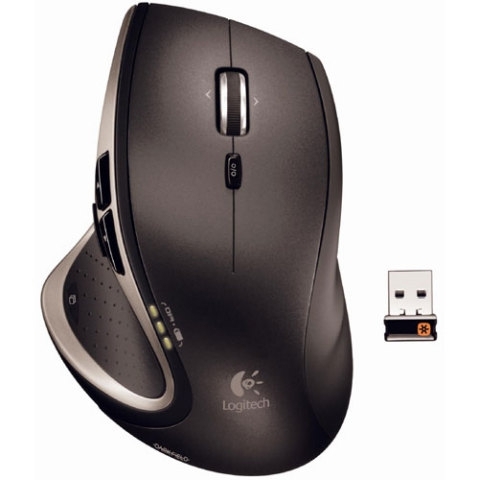 The Logitech® Unifying receiver was plugged in and the mouse connected right away with no problems using Windows 7. As I stated before, the Logitech Performance MX works on many surfaces due to the Darkfield Laser Tracking Technology. Apparently, Darkfield Technology reads the individual dust particles to function properly. Needless to say, I'm not someone who cleans my desk every few minutes to keep it free of dust, so it works just fine. All of you out there with glass top desks can throw away that mouse pad that you've been using all these years! To start with, the mouse is for right-handed use. There are four task buttons: the app switcher, the forward and back buttons and the zoom button. The app switcher shows you all of your open windows on one screen when pressed. The back button allows you to step backwards through your previous views. The forward button moves you to subsequent views in the application that you're using. The zoom button opens an icon and you'll use the scroll wheel to zoom in and out. There's a cable with a standard USB connector on one end and a proprietary connector on the other end for the mouse. The USB connector can be plugged into a computer USB port for charging the mouse or just to use it as a cable connected mouse. It comes with a 120 V AC USB charging adapter. You'll also get a USB port extender to plug the Logitech® Unifying receiver into if needed to move the receiver closer to the desktop. There's also a very nice vinyl pouch to store everything in which comes with the Logitech Performance MX. About two montths ago, I switched away from the Logitech MX1000 to use the new Logitech Performance MX. The fit in my hand is about the same - comfortable. There's no more running out of battery juice and having to switch to another mouse or stopping until it charges back up. If the batteries run low, I can just plug it into the charging cable and keep going. Alternately, if you want just plug the cable into your USB port and use it as a cabled mouse, that's an option too. There's no down time. To be honest, I do not use the forward and back buttons very much, but they're there if you need them. The zoom feature I'll use sometimes to enlarge pages for a better reading view. As far as the scroll wheel, I use it all the time. 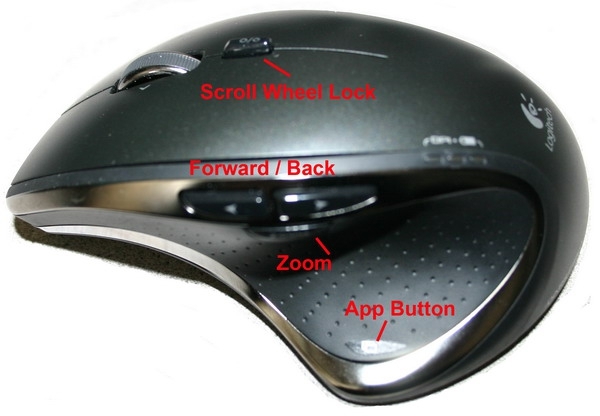 There are two settings for the scroll wheel: one is locked, and the other is free wheeling. I tend to leave mine in the free wheel position. On large websites it's a matter of flipping the wheel to scroll through many lines of text to get to the bottom or the opposite way to get back to the top. You can lock the wheel to where it will only scroll with single movements of your finger. The app switcher button is nice if you have several windows of applications open. You'll hit the app switch and select the window/app you want and click on it - a very nice feature to have. Let's not forget about the Setpoint Software that comes with the Logitech Performance MX. You'll be able to change some settings and features for each of the buttons and the scroll wheel. You can adjust the scroll settings, and speed. There's a battery power indicator, and game detection setting. I like the default settings for all the buttons as they are. Figure 1: The location of the buttons.